The building of this Hotel built in the end of Safavid dynasty and some changes in construction has been made in Qajar and Pahlavi dynasty. it have been reconstructed in 2013. Hotel is located in the center of historical part of the city.The famous Jame Mosque of Yazd is just 50 meters away from hotel. it has easy access to historical places and Recreation center of city. 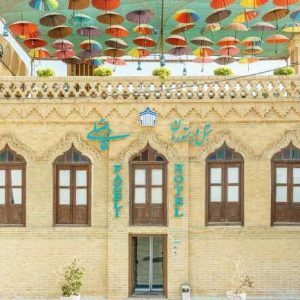 Hotel is located near Historical Building like Jame Mosque, Amir Chakhmaq Complex, Water Museum, Khan-e Lari, Alexanders Prison, Khan Complex, Ancient Towers & Ramparts of Yazd, Coin Museum, and Ethnological Museum.